If you follow me on Instagram, you may have seen that I made it into the Chicago marathon. If all goes well, I'll run my first marathon October 12th, 2014. Now I just need a plan and I have a few questions. Should I run four or five times a week? Should I do strength training and if so, what kind? Should I build up to one, two or three 20 milers? I know a lot depends on my goals. For now my goal is to finish strong and have fun. After five 100 mile months in a row, a combination of bad weather, work travel and lack of mojo caused a bit of a set back, but I should go into marathon training with a base of about 20-25 miles per week. 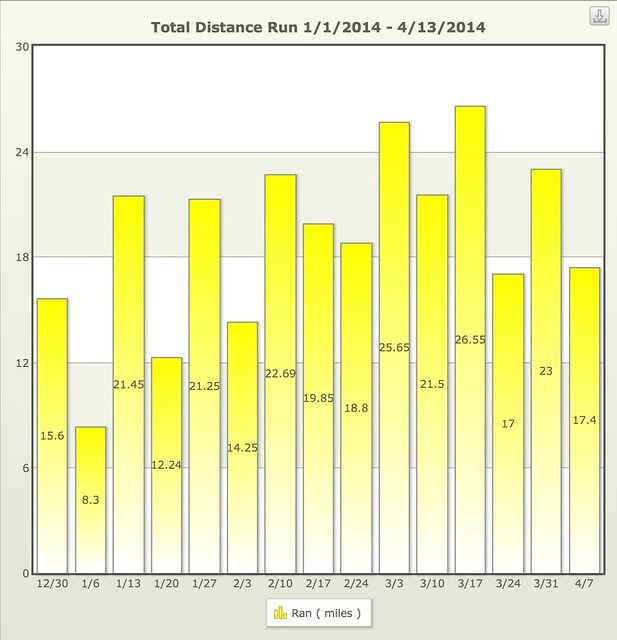 I looked at my weekly mileage and was surprised by the weekly variation. At least I'll have something to blog about again :-).